Lemon Bay Glass + Mirror is proud to offer a special promotion from PGT Industries. There’s never been a better time to buy WinGuard Vinyl. Ask how you can get PGT® WinGuard® Vinyl products with Free Low-E Solarban*. All PGT WinGuard Vinyl products-Series 500 are included in this offer. Orders must be placed between April 2 and June 29, 2012 and shipped by July 31, 2012. Low-emittance or Low-E is a microscopic thin coating, virtually invisible, metal or metallic oxide layers deposited on a window surface to reduce the U-factor by suppressing radiative heat flow. Coating a glass surface with a low-emittance material and facing that coating into the gap between the glass layers blocks a significant amount of radiant heat transfer and lowers the total heat flow through the window and into the room. *Note: Promotion cannot be combined with any other promotional or special pricing. 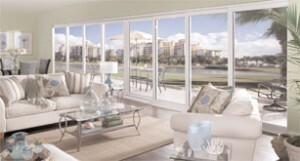 Contact Lemon Bay Glass directly for additional information on this special offer.